Our floor air registers are made with a metal, adjustable damper. This decorative heating vent can be used to diffuse both cold and hot air. When installing the floor air registers, all one must do is drop it into the hole opening in the floor. The decorative heating vent is durable enough to be used anywhere on the floor. 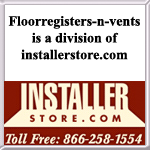 Purchase your floor air registers in one of the available 9 sizes. These Hamilton Sinkler decorative heating vents are constructed of solid brass. The unique floor air registers design is named Strathmore and comes finished in a classic flat black. Each decorative heating vents finish is plated and lasts longer than traditionally painted heating vents. Please note that the 2" vents will have a damper that measures 2 1/8" to fit industry standard. Note: Our floor air registers can take up to 10-12 weeks to ship directly from the manufacturer's warehouse once an order has been placed. Tip: When ordering these decorative heating vents, be sure to order according to the measurement of the wall opening. A 2" x 10" will fit into a 2" x 10" wall opening. The floor air registers faceplate will measure about 1 1/2 inches larger than listed hole size. Choose a decorative heating vent in another style or finish from our large selection listed online. Find floor air registers in a matching wall vent to create a seamless style in your home. Our Strathmore decorative heating vents will look great in your home or office. Place your order now!